My Road Trips For Food (RTFF) are traditionally about dessert. I choose restaurants that I read about and/or that are recommended to me, based on the final course (or in my case, the beginning). My latest RTFF came about thanks to the persistence of two friends. They kept telling me to go, but when I asked about desserts, they responded that they had not even tried them….REALLY??? And they wanted me to go for an RTFF?? Then I started getting pictures on my phone of nutella stuffed banana and strawberry filled French toast and I knew, quickly, that I had to get to Berry Fresh Cafe. Tim Timoteo is the Grand Berry of Berry Fresh Café. The original location in Port St. Lucie became so popular that they decided to venture down to Jupiter with a second one five months ago. Son Mitch is the Head Berry in Jupiter and Merry was most helpful up front answering my many questions. The name kind of threw me at first. I pictured more of a smoothie place than a lovely breakfast and lunch restaurant. Walking in for the first time felt like I was going to a place I frequented all the time. Everyone working there is lovely; all smiles and very happy to help. It isn’t often that we have a hard time deciding what to order. With a menu consisting of more than five kinds of eggs benedict, four kinds of French toast, seven kinds of pancakes (and I am not talking about fast food type of pancake! ), seven kinds of omelets, six kinds of hash, four ways to eat oatmeal, plus an entire board of monthly specials, can you blame us for having difficulty??? Finally, we figured things out. I placed an order for Chocolate Strawberry Banana Nutella Bacon Stuffed French Toast as well as an order of Blueberry Fritters for the table and then everyone was on her own. 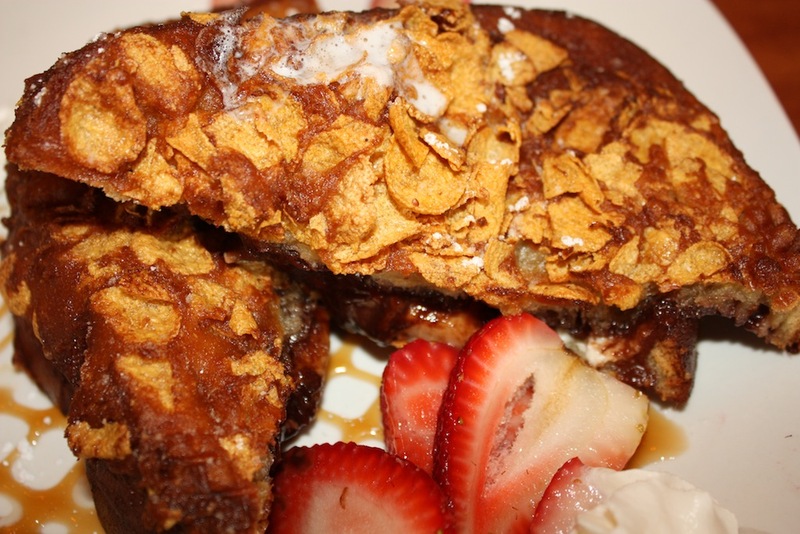 It is hard to put into words exactly how fabulous the Stuffed French Toast is. The cornflake crust is caramelized as it cooks and the crunchiness biting into it is heavenly. Are you wondering how all those flavors work together? In perfect harmony! The Blueberry Fritters were great, too. There is no question that these treats were hot out of the oil, because they are thrown into a paper sack filled with sugar/cinnamon, tossed around and served with a strawberry yogurt for dipping. Who says we did not get our fruit for the day? Each dish we had for lunch was exactly as promised on the menu. The portions are just the way I like them…full! Which was just what all of us were after lunch. But don’t worry…we always have room to try a few desserts. When I arrived at the restaurant and chatted with Mitch about the menu and questioned if desserts were made in-house (they are! ), Mitch told me about Miss Liz, the baker behind all the desserts. He said she was coming in at 1 and we thought we would miss her. Fate was on our side, because Miss Liz had enough time to bake up a batch of a chocolate cake with a sweet chocolate glaze and nuts on top. It was very sweet, but so delicious. We also shared a Chocolate Brownie and Strawberry Bar. I was a bit nervous about how the brownie was going to taste, because it was cakier than most and I wondered if it would still be moist. No worries…it was moist and addicting. As for the Strawberry Bars, I did not think anything could come close to the excellence of the Stuffed French Toast, but this did. Even as stuffed as we were, we had trouble stopping. If you are not near Jupiter or Port St. Lucie, six words…FIND A WAY TO GET THERE. Between Mitch, Merry, our wonderful waitress Kay, Miss Liz and Miss Liz’s daughter, Catherine, we felt like we were part of the family. Their warmth and love for what they create in the kitchen is delivered with every dish that comes to the table. Many, many thanks for a wonderful experience! Thank you for inviting us! It was another great lunch with beautiful friends! Cute atmosphere. Loved my granola yogurt w/ fruit & fresh leaf tea. Loved having you there Kristen!! I am so very sorry for my error! WOW! I am sure that Laurie is lovely and hope to meet her on my next visit. I have corrected the blog and thank you so much for bringing this to my attention!